In response to global urban population, Terreform, Inc.* has come up with an innovative way for New York City to deal with the issues that arise from this world wide problem. 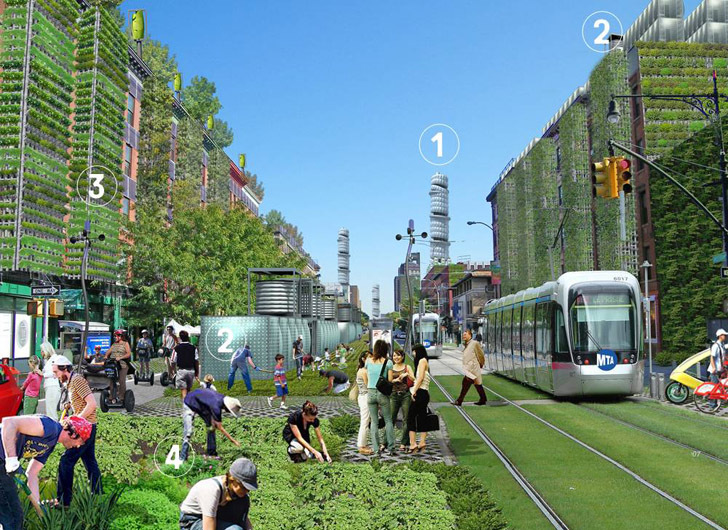 The plan, called New York City Steady State (NYCSS), calls for a system that would render New York entirely self-sufficient, reducing its ecological and carbon footprint exponentially. The new green plan is based on intensive data collected by NYCSS about the city’s supply and demand, and would rely heavy on urban farming. With the idea of a utopian economically independent city, NYCSS would infuse urban farming throughout all five boroughs. The plan was created by focusing on the food, waste, energy, production, water, air and climate that are specific to New York City. The city would be divided up into various centers, focusing on food production, open spaces, food growing cells, vertical farms, meat production towers, and neighborhood hubs. The plan would employ the plentiful unused rooftops on the buildings across our metropolis, as well as the building of new 30 storey farms, edible living walls, and street level farms. The framework would not disrupt the current urban flow, but only infuse edible greenery into the concrete landscape. The plan also envisions Times Square as a production hub, keeping the bright lights and theaters, combined with a large pedestrian area. Solar panels would provide shade, while collecting energy. Urban crops would line the pedestrian thoroughfares, and fruit bearing trees would provide shade. Keeping in line with Times Square’s penchant for oversized advertisements, a growing tower would feature an large LCD screen for ads. Streetwise, the plans foresee patches of farming everywhere, food growing cells for winter, and even a meat production tower to source the city’s meat as locally as possible. Although the overall plan seems drastic, if the city started employing even fragments of NYCSS, it could provide better for itself, as well as drastically reduce both its ecological and economic footprint. *Note: Terreform, Inc., originally called Commonspace, was founded by Michael Sorkin in 2005 and should not be confused with Terreform One, directed by Dr. Mitchell Joachim. What about tidal wetlands and marshes? Your work will last if you nurture wetlands and marshes. Louisiana is losing land because oil companies are destroying the mangrove swamps, marshes and wetlands. Love your idea but protect it if you want it to last. Terreform Inc. has some great ideas, but proposing all of this at once would be a bit overwhelming to the general public. First propose to convert every unused rooftop into either a greenhouse or regular seasonal garden. Low-maintenance crops for business towers, & every-day crops for residential apartments (since I\'m sure the people living in those apartments would much rather pick a tomato than take a subway to the nearest grocery store). Adapting that alone would dramatically improve the air quality & provide tons of food to everyone around there. If every restaurant did what the NYC locations of Whole Foods does, they\'d all have greenhouses & would grow their own herbs, spices, vegetables, & even short fuiit-bearing trees [with a little help from the practices of conventional horticulture]. I\'ve always wanted to do something about the unused rooftops of apartment buildings, but NYC is also very business-congested, so proposing low-maintenance crops to the appropiate business corporations, & telling them that they can \"hire volunteers\" to pick the produce or even capitalize & rent the space to restaurant owners who need more food production, would DEFINITELY convince them to give it a try. Terreform Inc. has some great ideas, but proposing all of this at once would be a bit overwhelming to the general public. First propose to convert every unused rooftop into either a greenhouse or refular seasonal garden. Low-maintenance crops for business towers, & every-day crops for residential apartments (since I'm sure the people living in those apartments would much rather pick a tomato than take a subway to the hearest grocery store). Adapting that alone would dramatically improve the air quality & provide tons of food to everyone around there. If every restaurant did what the NYC Whole Foods does, they'd all have greenhouses & would grow their own herbs, spices, vegetables, & even short friit-bearing trees [with a little help from the practices of conventional horticulture]. I've always wanted to do something about the unused rooftops of apartment buildings, but NYC is also very business-congested, so proposing low-maintenance crops to the appropiate business corporations, & telling them that they can "hire volunteers" to pick the produce or even capitalize & rent the space to restaurant owners who need more food production, would DEFINITELY convince them to give it a try. Could we just stop showing the vertical farms as one, some new idea that is news, and two, something that will actually work. Look, plants need sun to grow. Many crop plants need up to 8 hrs, so how do you grow plants on a north facing tower in a sea of towers. Maybe if someone actually does the work of logistics, cultivation, harvesting, distribution, etc of urban farming then we might have something of interest. Until then, please, stop highlighting these. I hope soon all country make that change in the city's for good of everyone. Lots very interesting here. Meat towers..? Bit squeamish about these. Yes think we do need to talk about protein and fat we need. But is there an urban version of www.polyfacefarms.com that would be better for us and for the animals? great! I want it straight here in Berlin! A city of windowboxes... interesting. Might want to also turn Central Park into a massive orchard. Then officially rename it The Big Apple (...Plantation). With the idea of a utopian economically independent city, NYCSS would infuse urban farming throughout all five boroughs. The plan was created by focusing on food, waste, energy, production, water, air and climate that are specific to New York City. The city would be divided up into various centers, focusing on food production, open spaces, food growing cells, vertical farms, meat production towers, and neighborhood hubs. The plan would employ the plentiful unused rooftops on the buildings across our metropolis, as well as the building of new downtown 30 storey farms, edible living walls, and street level farms. The framework would not disrupt the current urban flow, but only infuse edible greenery into the concrete landscape. The plan also envisions Times Square as a production hub, keeping the bright lights and theaters, combined in a large pedestrian area. Solar panels would provide shade, while collecting energy. Urban crops would like the pedestrian thoroughfares, and fruit bearing trees would provide shade. Keeping in line with Times Square’s penchant for oversized advertisements, a growing tower would feature an large LCD screen for ads. Streetwise, the plans foresee patches of farming everywhere, food growing cells for winter, and even a meat production tower, to source the city’s meat as locally as possible.